June 26th, 2011 was a low point. The Toronto Blue Jays had just swept the Cardinals, whose record stood at 41-38, and just 21-18 at Busch Stadium. They had lost 12 of 15 overall, and were 1-5 in 6 games following Albert Pujols’ broken wrist. 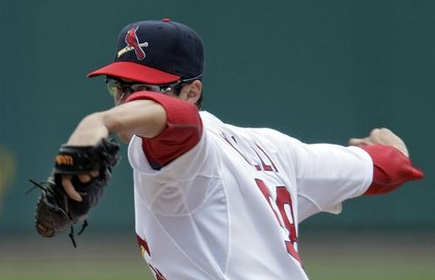 Joe Kelly was impressive in his MLB debut throwing 5+ innings of 1 run ball. Tony La Russa used seven players at first base, six at second base, eight at third base, five at shortstop, seven in left field and six in right field. Through the end of June, TLR had already used 67 different lineups. So here we are, June 11th, the Cardinals are 31-30 overall and in a rut. Mike Matheny reminds everybody that the team is grinding, battling, and patience is a virtue. But somehow the team with a +55 run differential managed 4 measly runs against three mediocre Tribe starters. Luckily nobody in the NL Central wants to run away. The Cards are just 2 games out of first place and reinforcements are coming once again. The loss of Jon Jay was brutal. He was hitting a cool .343 with 18 runs scored. The Cards found themselves with a hole up the middle. Shane Robinson got exposed, Skip Schumaker went on the DL, Allen Craig pulled his hamstring, Adron Chambers is NOT a starting center fielder, and Beltran’s knee cannot handle the rigors of the position. The list in 2012 is A LOT longer and murkier. Lance Berkman’s knee and Jaime Garcia’s shoulder are no small tweaks. We’ve heard “shoulder impingement” before from this medical department and uh, not good. The biggest downfall for any contender heading into a season is health. It started in spring with Chris Carpenter and continues to bite almost daily. One of the problems with the new wild card format is that teams will likely hold higher price tags for trade chips because even a team like Houston (26-34 overall) could feel they have a shot at the 2nd wild card slot if they get hot. Ownership can’t throw in the towel as easy because the fan base would go bizerk. 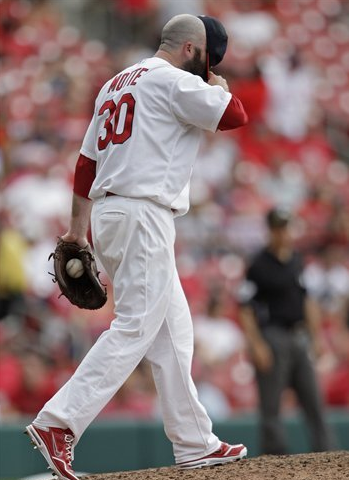 Jason Motte recollects himself on the mound following Jason Kipnis’ 3-run HR in the 9th. Shelby Miller certainly isn’t helping causes either. His 5.18 ERA in 12 starts at Memphis is alarming. His breaking pitches are not effective, and the hitters are too good to get away with an “above average” fastball. Hell, Jason Motte has a great fastball and it’s not fooling many hitters in the big leagues. Most importantly, the Cardinals need to just keep winning games. The Chicago White Sox are a very good baseball team. A slow start has them at 33-27, but in first place atop the AL Central. However, the schedule gets favorable. MLB hands St. Louis 6 games against a minor league ball club each year known as the KC Royals, and those games must be won. Keep grinding away; the season is 162 games for a reason. Minimizing the low points goes a long way, and the Cardinals have done a good job avoiding hitting rock bottom. The returns of Matt Carpenter, Chris Carpenter, and Jay are highly anticipated.